Olady - pancakes. Recipes from Russia. 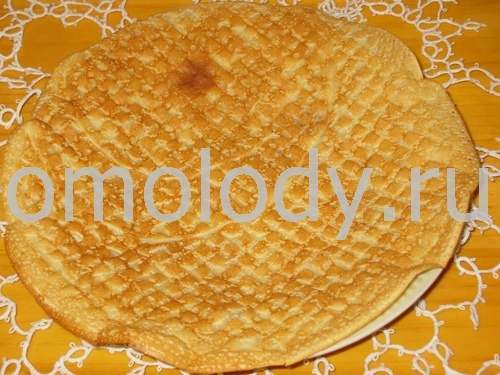 Description: Olady is kind of pancakes in Russia. They are little and very thick. You can put 5 - 6 Oladys on the pan. The base of batter for oladys can be buttermilk or sour milk or kefir. Olady resemble American pancakes, but more smooth in texture. 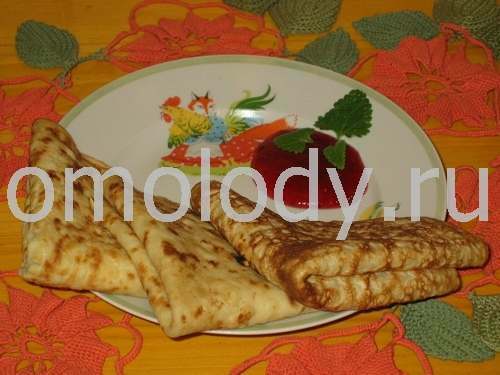 Blini resemble French crepes, but are thicker and heavier. 0,5 litter (1 pint) buttermilk or Clabber - Milk which has soured to the point where it is thick but not separated. 5 tbsp flour (with hill). 1 - 2 tbsp sugar. Whisk eggs with buttermilk (Clabber - Milk which has soured to the point where it is thick but not separated or sour milk). Add soda, sugar, salt and flour and mix thoroughly. The batter must be dense but liquid, if it is not, add more flour. Beat the batter so that there are no flour lumps in it. Pour a 1 tbsp vegetable oil into a pan. Heat the pan. Pour 5-6 little rounds of batter on the pan. Cook until light brown, about 2 minutes on each side. Repeat with the remaining batter, add oil as needed. Oladys can be served with butter, or sour cream, or jam.